I personally like the c-hub more. The steering and the aggressive style is more my suit. I am faster with the c-hub but not as consistent. Hmmm, anyone want to trade all the C-hub parts for all the PBS parts? I mean if you are going to run C-hub only, and I'm going to run PBS, then a straight up trade for the parts bag out of the 2019 kits could make sense. Just a thought. I purchased two kits, (one for race day and one for practice), so I technically I have two full front ends I probably wont use. My second thought was to build one of each setup, and have a parts kit for each front end from the other kit. Slap the car on the track and see what worked better. Choices,.. choices...? LOL. How much faster is it for you? How is it about a rough track and the c-hub from your own experience? laptime wise, its upwards of a half second faster.. consistency is low with it though.. i have not had it on a rough track yet. the season here hasnt started up just yet.. so i been mainly club racing with it at the local track. Last edited by dgrobe2112; 02-18-2019 at 09:29 AM. laptime wise, its upwards of a half second faster.. hot lap maybe even higher.. i have not had it on a rough track yet. the season here hasnt started up just yet.. so i been mainly club racing with it at the local track. A half second is huge when its repeatable. Looks like I'm going to need to try the C-hub. Do you think that decrease in lap time is mostly due to better rotation mid corner? Does it seem that the front end is hooked throughout the entire corner allowing rear to pivot a tighter line? Or do you feel the front pulls harder exiting the corner with better traction under power? You running loam or hard pack on that local track? We run on a high notb grooved track. Look up Thornhill racing circuit. Hard packed clay. It really turns in hard on the low speed corners. I think it has more corner speed and holds a tighter corner. Still working on dialing in the setup. It's not as consistent as the PBS at the moment. anyone been running the new 2019 much yet? im interested to see what everyones thoughts are on the new caps and bladders? i built my car using my old shock setup.. tried the new caps and bladders this past weekend for a day.. didnt really seem to like them with the same oil i had in the shocks from previous setup.. still some work to do.. they were very aggressive.. and didnt really do well on the rough parts.. did improve landing jumps.. but i ended up with the old caps and bladders..
also.. i got an updated setup sheet on the xray page.. planning on a few different things that should help get the consistency where i want it..
Do you think the new caps have an effect to the performance? I thought this 4holes are only for easier bleeding and servicing. The bladder of course will make a difference. I ordered them but haven’t received it yet but I will running it with the screw caps. 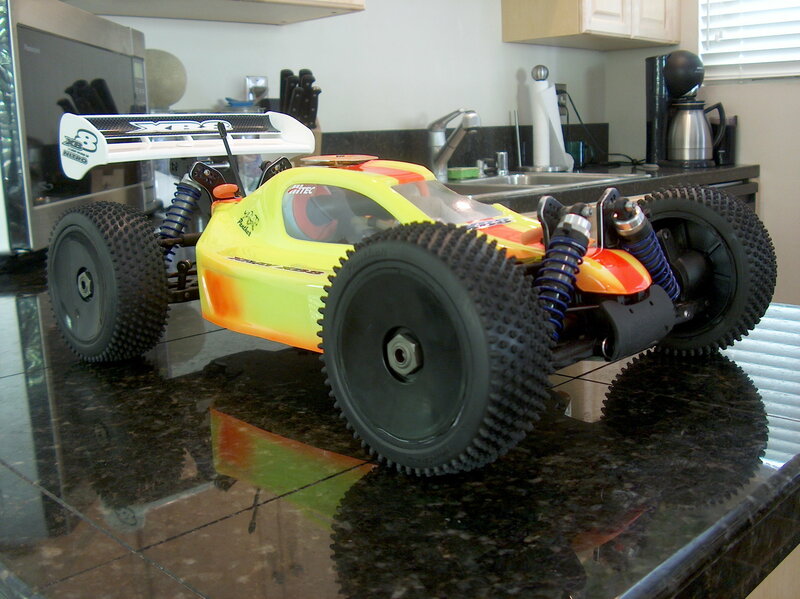 Thought you all might like to see an old 2006 Xray Buggy. 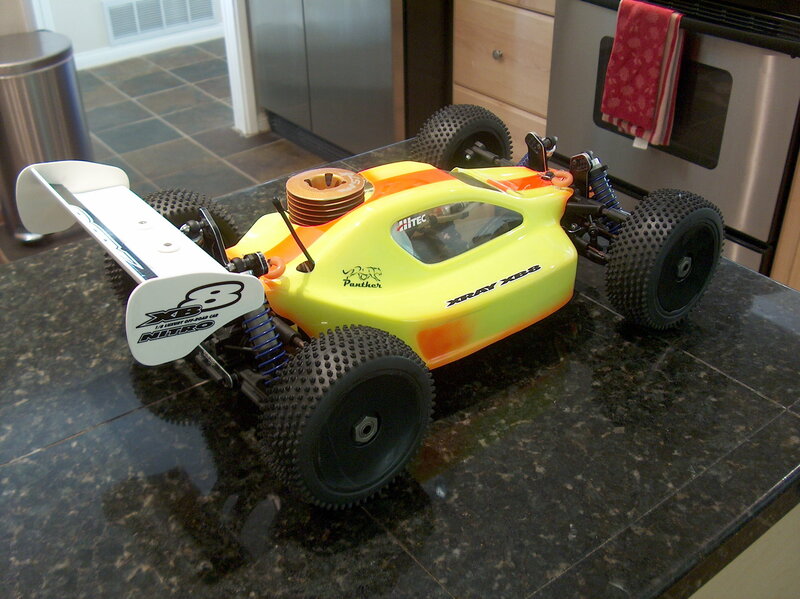 I raced this one many years ago, completed 16 races in a row with this chassis, and won boxes full of blowing trophies. It was the lightest buggy on the track at this time, jumped better than anything, made quite a few club race A-mains with Drake and other top local pros. Good times! This new car is sooo much better, I cant wait!